There’s an old Seinfeld episode in which George Costanza frequents a take-out pizza place – the kind with the tip jar at the cash register – and every time he gets a pizza he puts a dollar in the tip jar. However, the cashier always turns away just as he’s placing it in the jar, and never sees him do it. This infuriates George, so he keeps returning to the place and with great flourish places the dollar in the jar to be noticed, but every time the cashier turns aside. Finally, his frustration gets the best of him and he reaches back into the tip jar to retrieve the dollar he just put in (without being noticed of course), and just at that moment, the cashier turns back to see George stealing from the tip jar! We want to be recognized for our good efforts. Right? 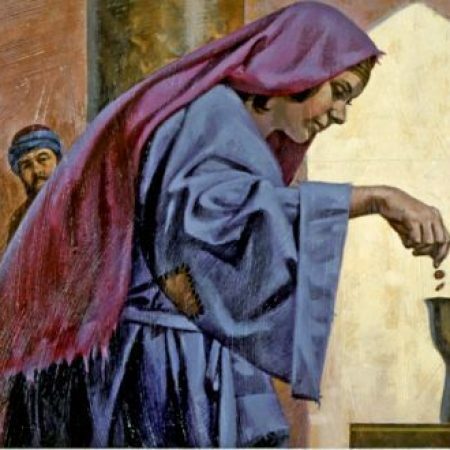 The religious professionals in our Gospel reading from Mark might have been named George for all their ostentatious displays of look-at-me-giving. When we are honest with ourselves, when we tell the truth, few, if any of us, are in the same position as the widow, giving the last of her lepta to an institution that she trusts, to her God in whom she hopes. Sure, we gladly offer up portions of what we have, after some careful calculations, managing the risks. But there’s no way we are contributing our all – and we likely never will. More often than not, we let go of what we have only with guarantees in place, after establishing fair transactional principles, after determining that our (OUR) money will be well spent to our approval. In the end, none of us wishes to be her. She’s a widow after all – and we know all too well the status of widows in the ancient world. Who desires to be alone, destitute, or dependent? And besides that, she willingly gives what little she has away – and we know all too well that’s something we are not going to do. So what if the widow’s mite is not just two coins – but a might (m-i-g-h-t) born of faithfulness and dependency. I witnessed the power of this on Friday. A month ago or so, there a young man in Acton had what was likely a psychotic break and attacked his parents. His mother, Carol, lived; while his father, John, did not. Friday, I went to John’s funeral. And it is clear that the church isn’t just holding Carol; it’s holding her together – or more specifically, it is the place where she is being reminded minute-by-minute that she is held in the hand and care of a God who is more powerful than the tragic death of her husband and fate of her son. She is at the same time faithful to and dependent on her church. Because even the best friends in the world can’t provide the peace that is needed in the face of devastation – for my friend Carol, for veterans suffering PTSD, for people who are oppressed and marginalized. There’s an old story about a wise woman who was traveling alone in the mountains. One day as she was crossing a stream, she looked down and saw a precious stone glittering back at her from beneath the clear, running water. She bent down and picked it up. Drying it on her shawl, she examined it carefully, realizing its value, she placed it in her bag. The next day she met another traveler, who had run out of food a day earlier, and was very hungry. The woman offered to share her food with him. When she opened her bag to take out some food, the hungry traveler saw the precious stone. Impetuously, he asked her to give it to him. And without hesitation, the woman reached back into her bag, and gave it to him. It’s a nice story and all, but this wise woman is still a little too much like the widow – and like with the widow we’re not that generous, and probably won’t ever be. More realistically we’re the hungry traveler. We might or might not be hungry for food, but we’re certainly hungry. And in this way we ARE like the widow, dependent on others. And just like the widow; Jesus sees us. She is not, in the end, an object lesson, but a person. Easily unseen, even invisible, yet worthy of Jesus’ attention. Same with each of us, no matter what our status or wealth, we have days – and some of us have many of them– when we feel invisible, unremarkable, not worthy of attention. Yet Jesus also sees us, deems us worthy of God’s attention, and frees us to give the same compassionate regard to others. The widow’s might is great indeed. A might greater than power. A might greater than the grandest buildings. A might greater than the most splendid displays that are mostly privilege in disguise. Her two coins won’t make an impact on the temple budget; but they make all the difference for her. You see her two coins meant that she had to trust God, her family, her friends, her “church” to sustain her. Very un-American, I know. But remember the Christian life is about the Kingdom of GOD, not the Kingdom of American values – “I can do it by myself thank you very much” values. God made us to be dependent on one another, and on Him. Jesus sees us, in our vulnerability and our arrogance. And when we know this – really know this – we give, and we become faithful in the giving. So what if we give not because it makes a difference to the budget, but because it makes a difference to us – and not just as individuals, but as a body – Christ’s body – the church. Because I don’t want us to be the church where “good enough” is “good enough,” with the low bar of low expectations. No – Christ gave his life for us – his WHOLE life as an outpouring of love. This is the best news there is. And I hope that everyone who calls this church home would be moved to gratitude and joy and a desire to share not just two coins, not just a large sum, but our whole lives as well. Next week when we come to church we will have a time when we bring forward our pledges – our financial promises to support the work of the church – and place them in a box up front here. And we do it this way, not to make a show of it, but because when we walk forward, we are bringing our whole self. It is in this way, symbolic, and symbols are important. As you contemplate your pledge to the church this week, and discuss it in your family, remember, God has designed us to need each other: You need the church and the church needs you. And God sees you – really sees you.